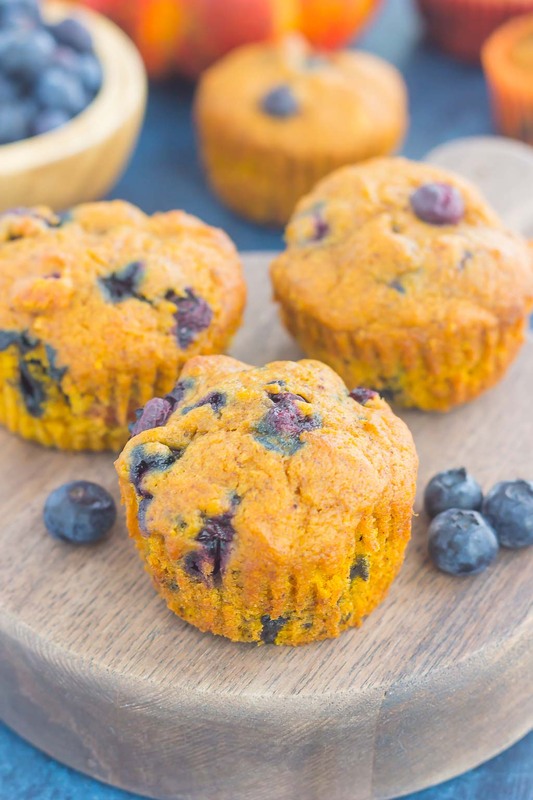 These Pumpkin Blueberry Muffins are soft, moist and bursting with cozy fall flavors. 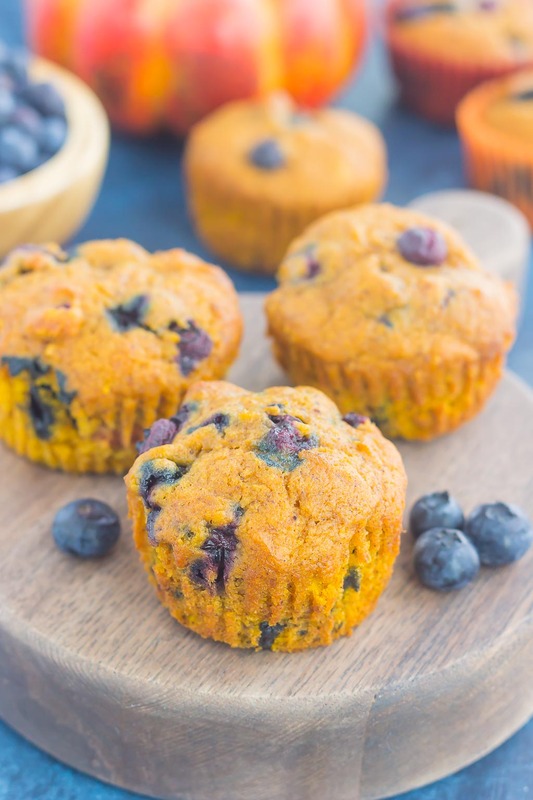 Packed with sweet pumpkin and juicy blueberries, this easy treat makes the perfect fall breakfast or snack! Pumpkin, pumpkin, who’s got the pumpkin? I do, of course! With a name like Pumpkin ‘N Spice, I have to be sure to give you ALL the pumpkin recipes come fall. I do love pumpkin and I’m hoping you do, too! Which brings me to my blog name. I often get asked about how I came up with the name ‘Pumpkin ‘N Spice,’ and if you’ve read my About Gayle page, then you already know the answer. But, for those of you who haven’t, I thought now would be the perfect time to share. Yes, I do love anything and everything pumpkin, but that’s not actually why my blog is named that. My aunt actually came up with the name! Growing up, she called me ‘punkin’ and the name kinda stuck. From email addresses to my very first AOL screen name (yep, I’m showing my age), pumpkin was my name of choice. So, it just seemed like a natural fit for my site! And come fall, I feel like I need to get extra creative with those pumpkin recipes. From savory dishes to those extra delicious sweet treats, I’ve got them all. 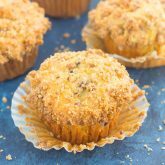 And today I’m sharing one of my absolute favorite baked goods, muffins! If you’ve been hanging around here long enough, then you might remember these Pumpkin Nutella Muffins from three years ago. They’re one of my most loved pumpkin treats around here, so I decided to take the same muffin, but swap out the Nutella for blueberries. And you know what? 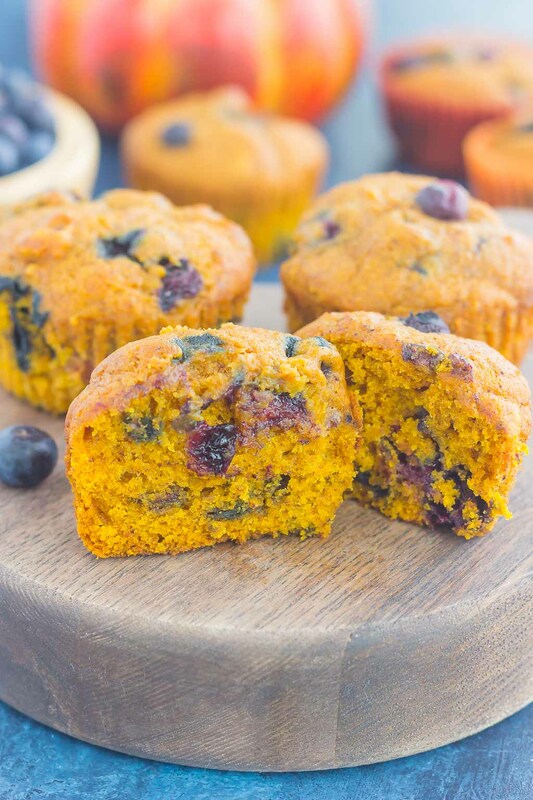 These Pumpkin Blueberry Muffins might just be my favorite kind to date. Sweet, but not too sweet and bursting with just the right amount of pumpkin flavor. And the fresh blueberries give this baked good the perfect amount of tang. If you’ve never tried pumpkin and blueberries together, now is the time, friends! 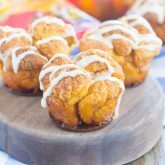 Just like my other muffins, these are a breeze to whip up. Just two bowls and no mixer required. How nice does that sound? To achieve the bakery style muffin appearance, preheat your oven to 425F and bake the muffins for 5 minutes at that temperature. Then, without opening the oven door, lower the temperature to 375F and bake at this temperature for the rest of the time. 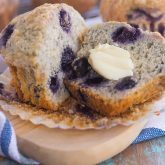 If you don’t want your blueberries sinking to the bottom of the muffin batter when baked, be sure to toss them with a little all-purpose flour. This helps to coat them and keep them suspended in the batter. Be careful not to overmix the dough! That will result in a dense and chewy muffin, not a light and fluffy texture that we are going for. And did I mention how wonderfully these Pumpkin Blueberry Muffins bake up? Soft, fluffy and packed with flavor. Now that’s my kind of muffin! 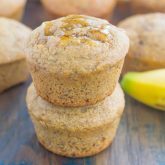 These muffins are great for a grab ‘n go breakfast, a quick afternoon snack, or a light dessert. They also freeze beautifully, too. I like to keep a few in the freezer for when my pumpkin cravings strike. Just let it thaw and then pop ’em in the microwave for an easy snack! 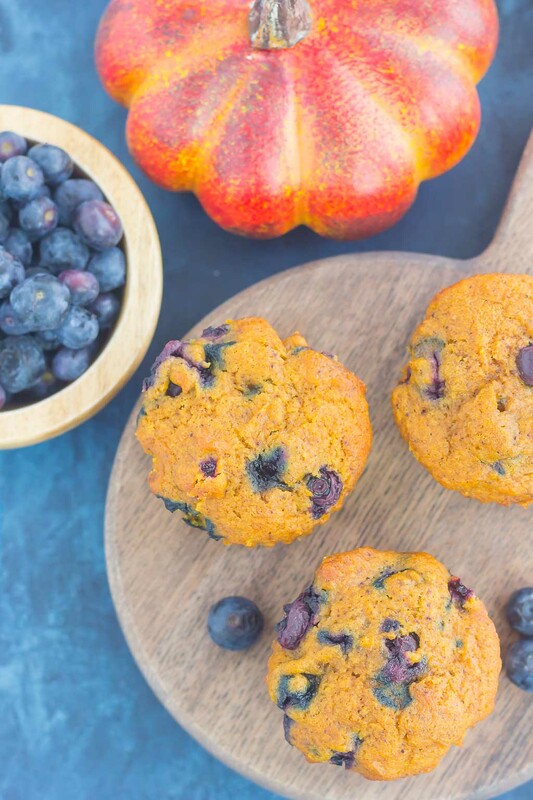 So if you’re looking for that easy pumpkin recipe that doubles as both breakfast and dessert, these Pumpkin Blueberry Muffins are it. I guarantee these will get a rave review from all of you pumpkin lovers out there! Looking for more pumpkin recipes? I’ve got you covered! Preheat oven to 425F. Line two 12 count muffin pans with paper liners or grease well with non-stick cooking spray. Set aside. In a medium bowl, combine the flour, white sugar, brown sugar, baking powder, baking soda, salt, cinnamon, nutmeg, and cloves. Set aside. In a large bowl, whisk together the eggs, vanilla extract, pumpkin, and coconut oil. Stir the flour mixture into the wet ingredients until just combined, being careful not to overmix. Gently fold in blueberries. Spoon mixture into prepared muffin pan, filling 3/4 of the way full for each cup. Bake for 5 minutes at 425F, then, without opening oven door, lower temperature to 375F and bake for about 18-20 minutes, or until toothpick inserted into center of muffin comes out clean. Baking at 425F first helps to achieve that high, bakery style muffin. I'm SO intrigued by the combo of pumpkin and blueberries! Seriously sounds so good and these muffins look insanely soft and moist, Gayle! Perfect way to kick off all the fall eats! Thanks, Sarah! Such a good combo! 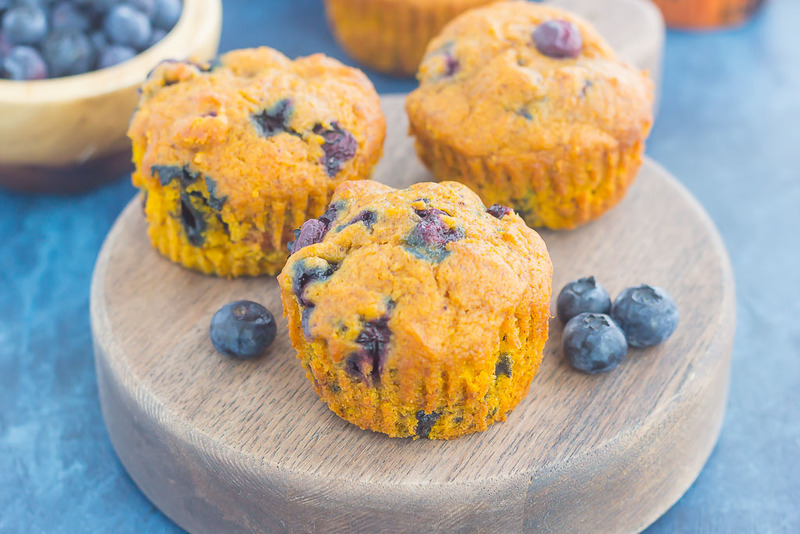 I've never thought to combine pumpkin and blueberries but since I love both ingredients so much, I know I'd love them together! The contrast in color makes these muffins so pretty, and they look so perfectly fluffy! It's such a great combo, Marcie! Thank you! IF I don't have coconut oil on hand what can I substitute it with? Hi Rachel! Vegetable oil would work just as well!